Solve Alfred's WebViewer Black Screen Problem! - Frequently Asked - Alfred Center | get the most out of the best home security app! Solve Alfred's WebViewer Black Screen Problem! Are your browser settings slowing Alfred’s WebViewer down? Do you have to stare at a black screen and wait half a minute before you get the feed? Great news: we figured something out that’s worth a try if you use Windows! Go to Options – General. 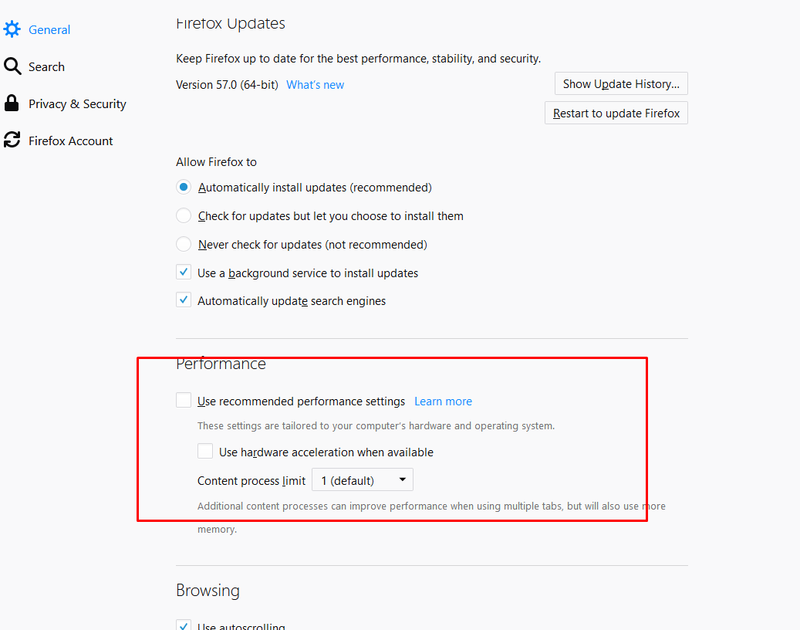 Uncheck Use recommended performance settings. Go to Settings – Advanced – System. Disable Use hardware acceleration when available. Let us know if this does the trick! How to remove webview beta? This didn’t solve the problem in two different versions of Chrome on different PCs and one Firefox. In WebViewr I get black screen without sound from the rear camera. It is odd that when i switch to the front camera, both picture and sound are OK. When i use the app as a viewer both cameras work fine. Could you try one thing for us? Could you wait 20 seconds after starting a live session on Alfred’s WebViewer to see what happens? Sometimes a slower/relay connection could cause this. Oh hey, problem solved! Thank you so much for letting us know! We hope it’s all smooth sailing from here! In my case the problem is still here, with three different device with default front camera. Black screen and no sound on Firefox 50 beta and XP. I tried to change on false the first one without success. With Alfred android app no problem. Can you try Firefox 49 or Chrome instead? We are hoping one of those will work. If it still doesn’t, it could be your Internet connection and that’s much harder for us to give advice. With Firefox 49.0.2, Alfred WebViewer works fine. Thanks for trying and keeping us posted! Looks like the issue is limited to the beta version of Firefox. Try to stick to 49 for the moment! web viewer: smal pic but black, when I open it for the life view. Unfortunuately it didn´t save the Problem. Could you try two things for us? Update your Firefox browser, or try it with Chrome. Turn off your firewall and try again. Please let me know if any of this works! No, this did not work. I even paid for a subscription, but I will not be recommending this or renewing it unless this problem can be resolved. I’m still having problems. When the phone is left for a long time, regardless of power saving mode being functional or not, it won’t show what’s happening. Also, the motion detector doesn’t work after a duration as well. It’s a good app and all but I expected it to be a lot less buggy for the upgrade. We took a quick look at the connection logs and saw that your Camera tends to run on battery. Devices running on battery often enable power-saving mode and reduce WiFi reception capacity. To ensure continuous surveillance, we suggest you keep your Camera plugged in. Update Alfred to the latest version. Alfred runs best when all devices run the same version. Turn WiFi off and back on again. Make sure the date and time are correct. Launch Google on PC > log in to your account > choose My Account > Sign-in & Security > App with account access > Tap on Manage Apps > find Alfred, and choose REMOVE ACCESS. @amyhopper1986 what device are you using ? Has anybody else got access to your account or phone ? Alfred Webviewer always goes to a black screen after a few moments of live feed. I have tried virtualy everything in this thread. Could you please let us know which browsers you are using? Also, please provide us the screenshot by following the steps below to help us look into it for you! Another question, does the black screen issue also happen when you watch live feed on your Viewer on mobile device? Oh yes oh yes, the black drag thing. I seen it too. It is very confusing sometimes. It looks like there’s something creeping out of the walls in my apartment. It is very freaky and very good. Anyway oh, I like using Alfred besides the point.